2. Fr. Land Belonging to Br. 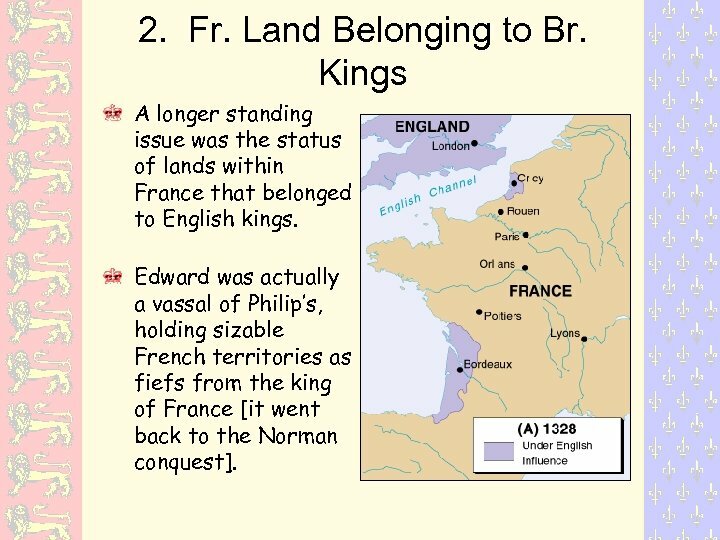 Kings A longer standing issue was the status of lands within France that belonged to English kings. 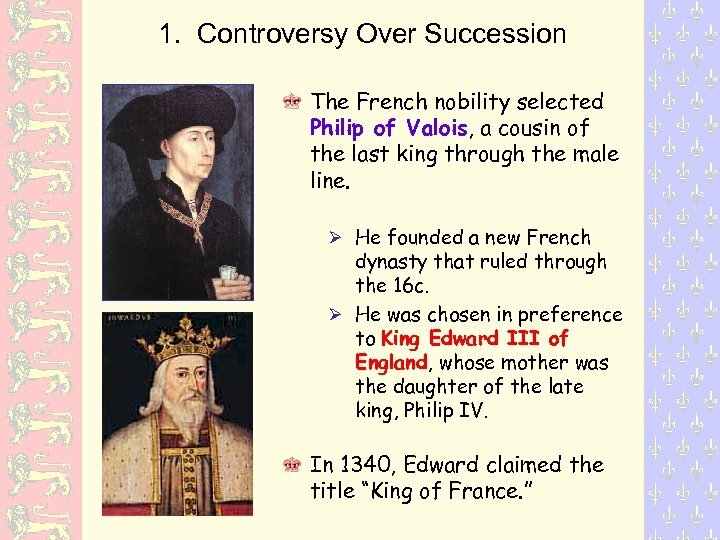 Edward was actually a vassal of Philip’s, holding sizable French territories as fiefs from the king of France [it went back to the Norman conquest]. 3. 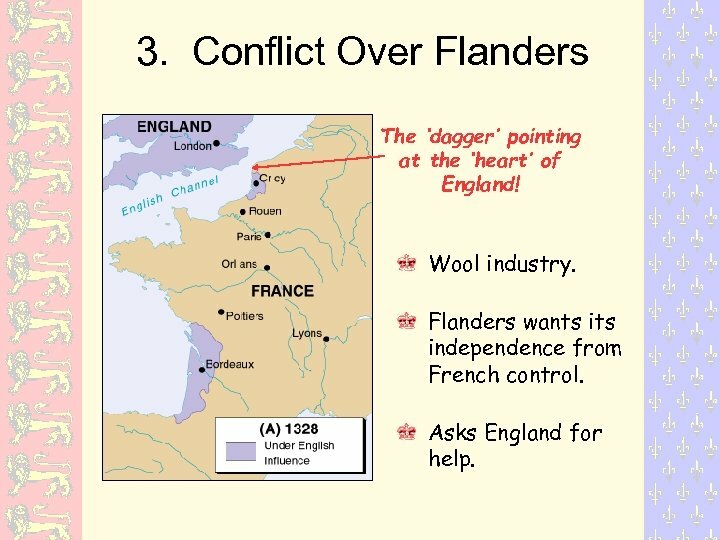 Conflict Over Flanders The ‘dagger’ pointing at the ‘heart’ of England! Wool industry. Flanders wants independence from French control. Asks England for help. 4. 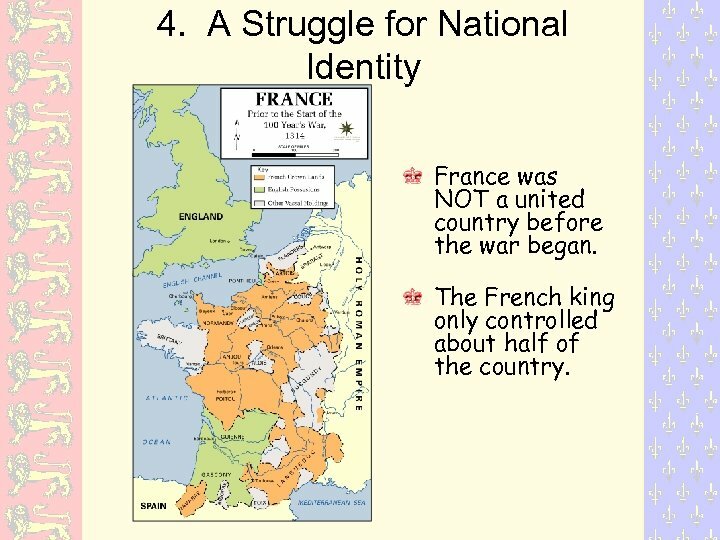 A Struggle for National Identity France was NOT a united country before the war began. The French king only controlled about half of the country. 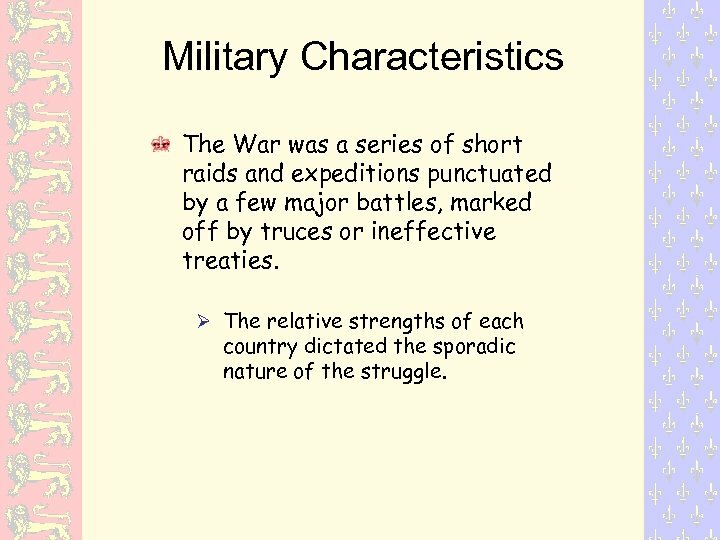 Military Characteristics The War was a series of short raids and expeditions punctuated by a few major battles, marked off by truces or ineffective treaties. The relative strengths of each country dictated the sporadic nature of the struggle. French Advantages Population of about 16, 000. Far richer and more populous than England. 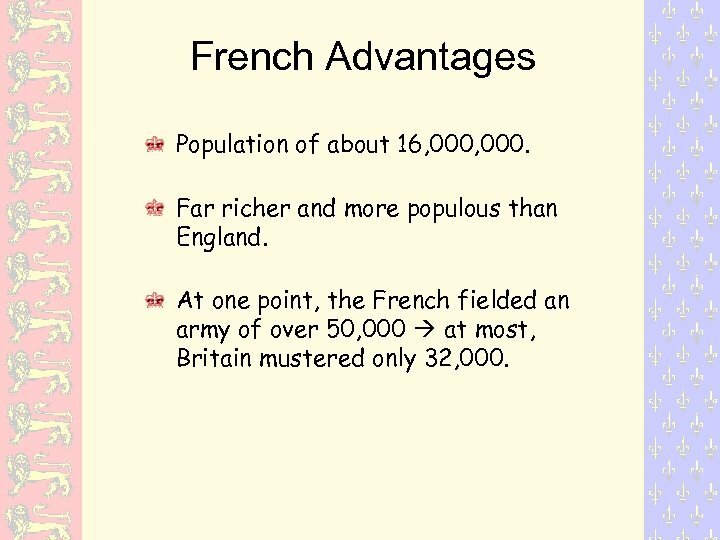 At one point, the French fielded an army of over 50, 000 at most, Britain mustered only 32, 000. 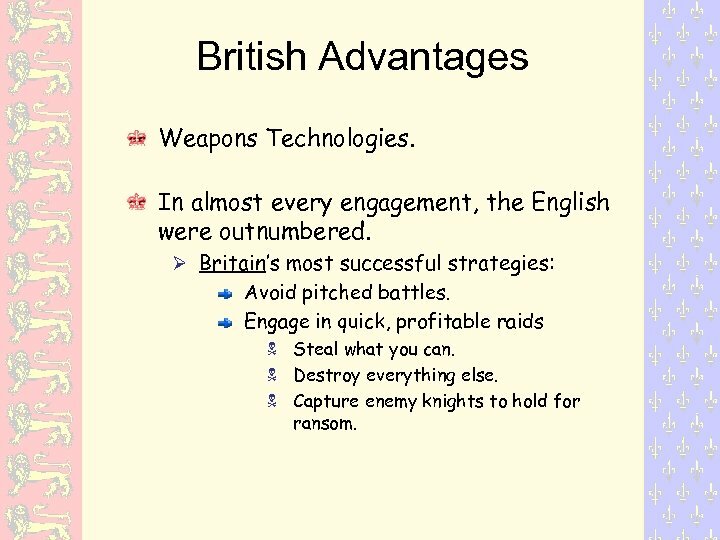 British Advantages Weapons Technologies. 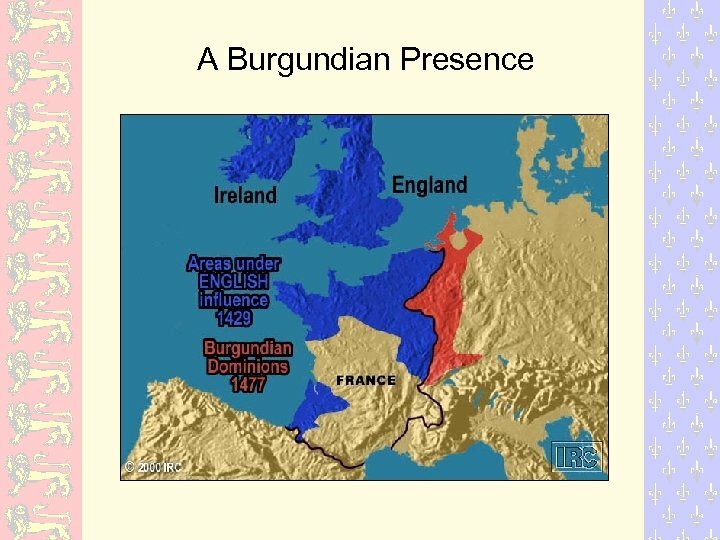 In almost every engagement, the English were outnumbered. Britain’s most successful strategies: Avoid pitched battles. Engage in quick, profitable raids Steal what you can. Destroy everything else. Capture enemy knights to hold for ransom. 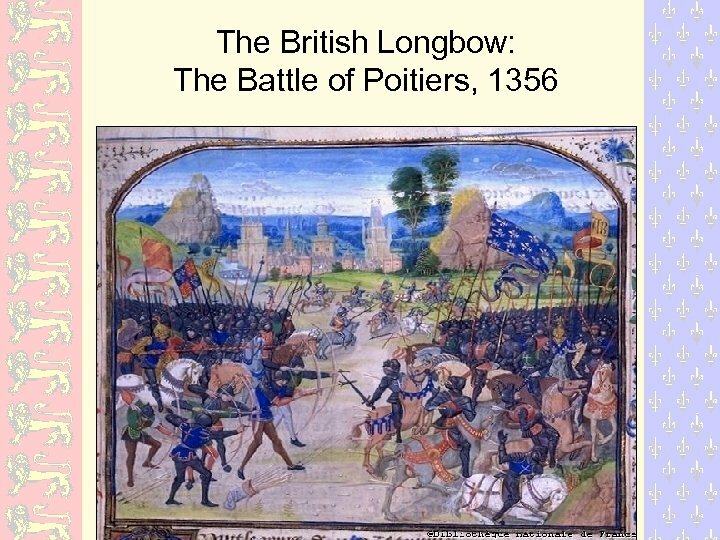 The Longbow as a Weapon The use of the English defensive position was the use of the longbow. 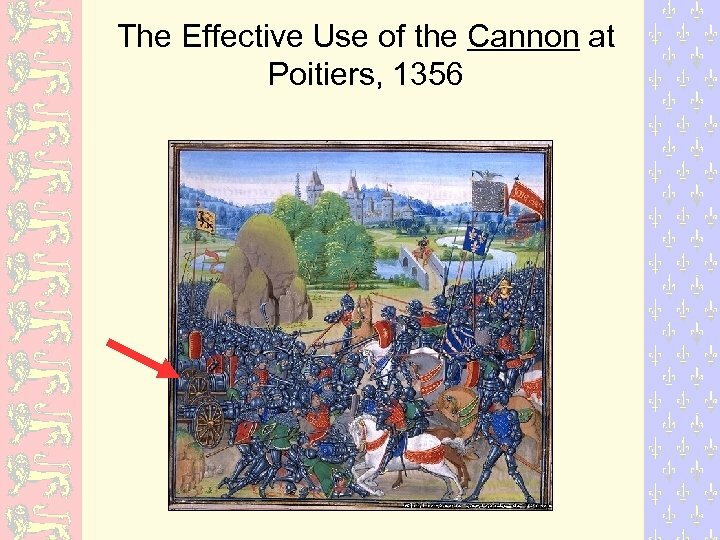 Its arrows had more penetrating power than a bolt from a crossbow. Could pierce an inch of wood or the armor of a knight at 200 yards! 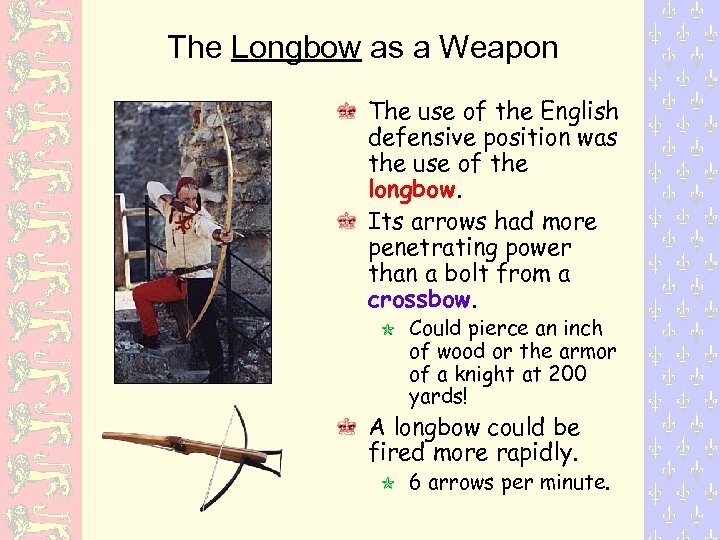 A longbow could be fired more rapidly. 6 arrows per minute. French Confusion The English captured the French king, John II [r. 1350 -1364]. France was now ruled by the Estates General A representative council of townspeople and nobles. Created in 1355. Purpose to secure funds for the war. 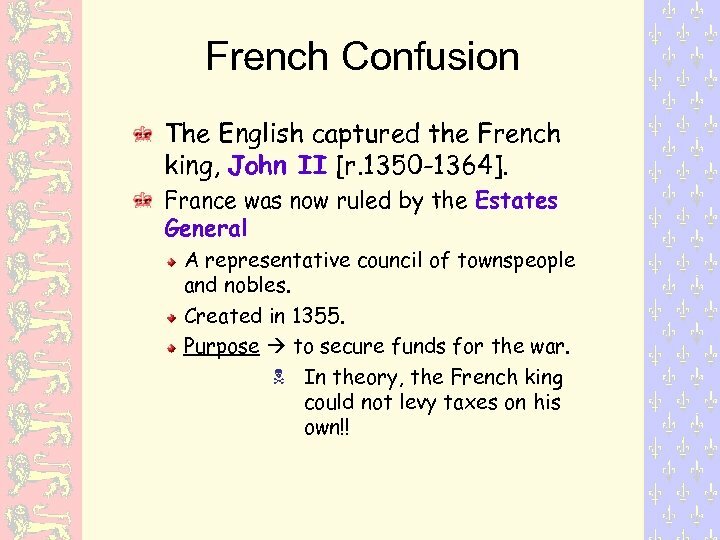 In theory, the French king could not levy taxes on his own!! 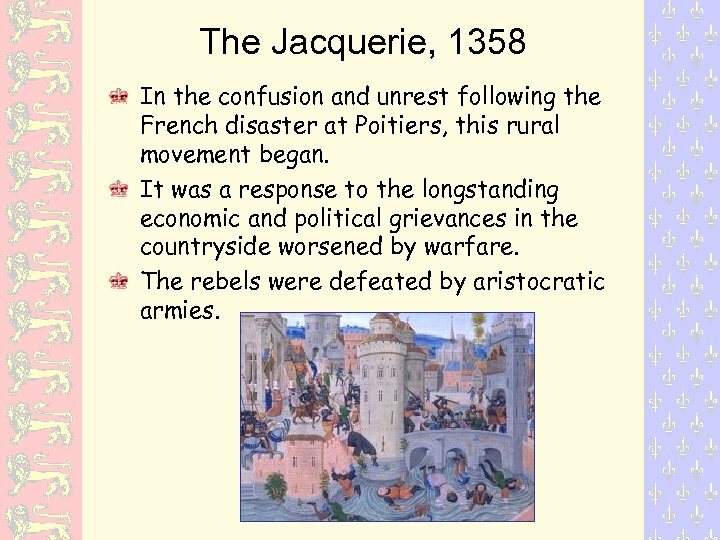 The Jacquerie, 1358 In the confusion and unrest following the French disaster at Poitiers, this rural movement began. It was a response to the longstanding economic and political grievances in the countryside worsened by warfare. The rebels were defeated by aristocratic armies. 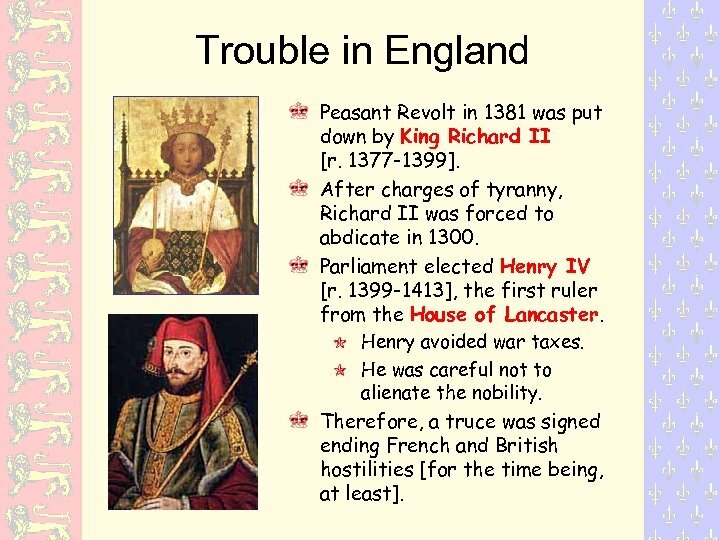 Trouble in England Peasant Revolt in 1381 was put down by King Richard II [r. 1377 -1399]. After charges of tyranny, Richard II was forced to abdicate in 1300. Parliament elected Henry IV [r. 1399 -1413], the first ruler from the House of Lancaster. Henry avoided war taxes. He was careful not to alienate the nobility. 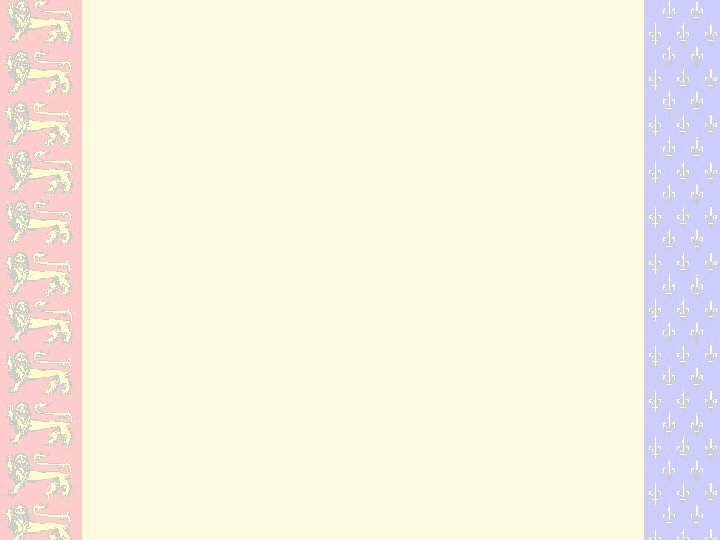 Therefore, a truce was signed ending French and British hostilities [for the time being, at least]. 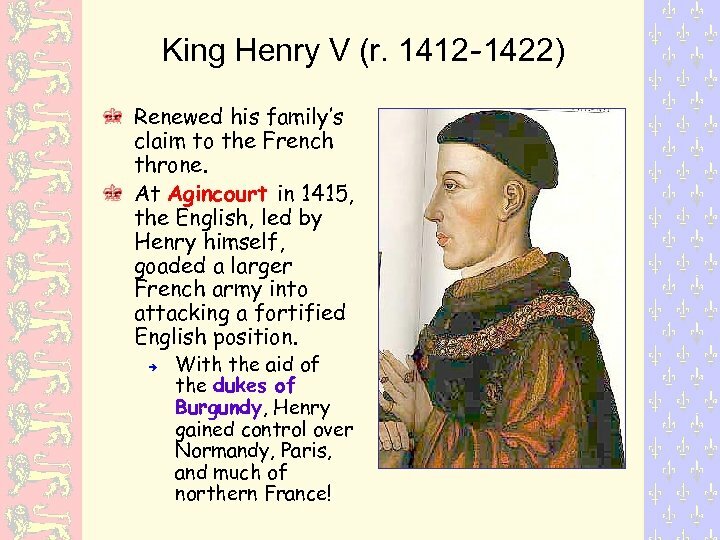 King Henry V (r. 1412 -1422) Renewed his family’s claim to the French throne. At Agincourt in 1415, the English, led by Henry himself, goaded a larger French army into attacking a fortified English position. With the aid of the dukes of Burgundy, Henry gained control over Normandy, Paris, and much of northern France! 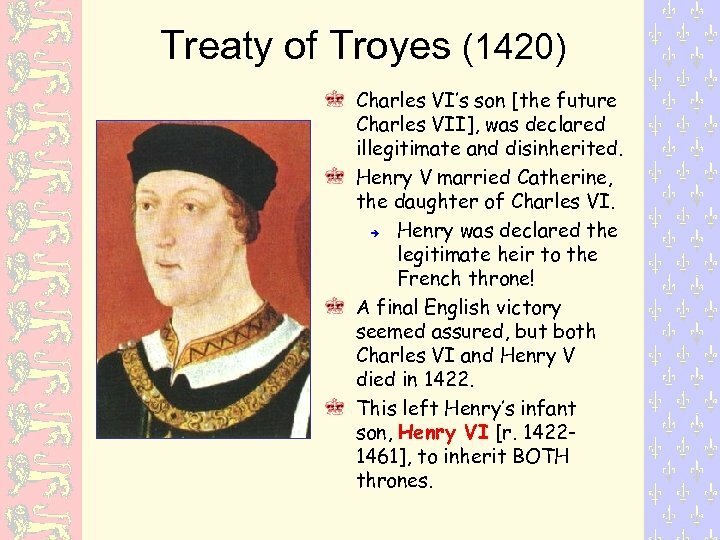 Treaty of Troyes (1420) Charles VI’s son [the future Charles VII], was declared illegitimate and disinherited. Henry V married Catherine, the daughter of Charles VI. Henry was declared the legitimate heir to the French throne! 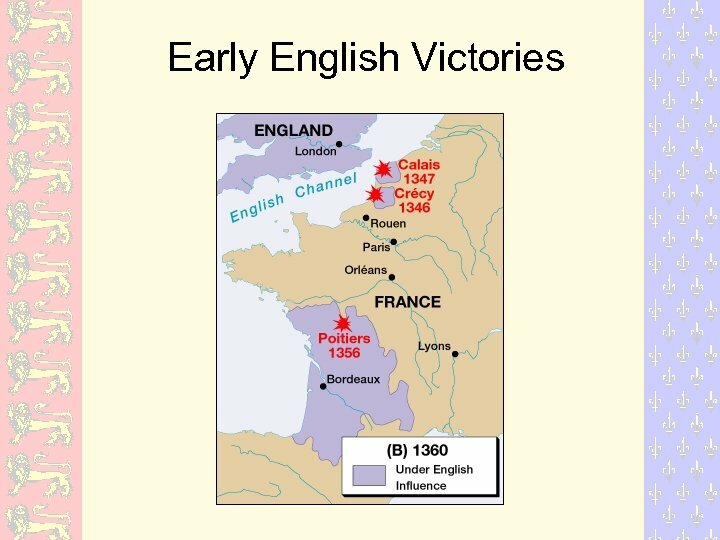 A final English victory seemed assured, but both Charles VI and Henry V died in 1422. This left Henry’s infant son, Henry VI [r. 14221461], to inherit BOTH thrones. 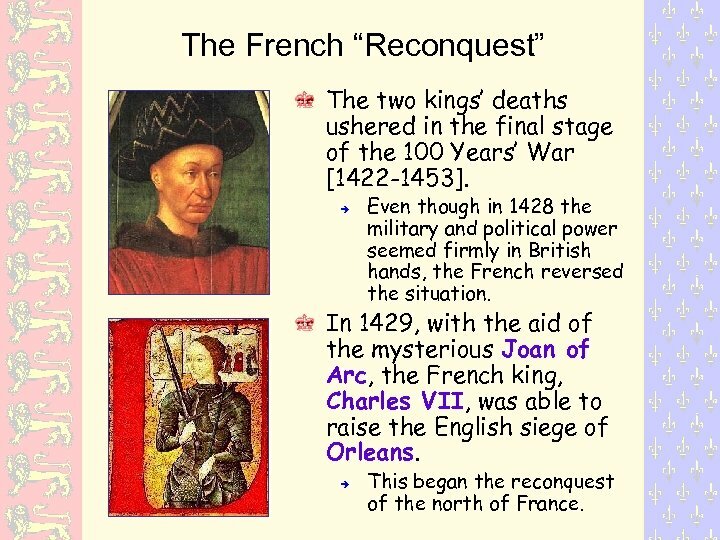 The French “Reconquest” The two kings’ deaths ushered in the final stage of the 100 Years’ War [1422 -1453]. 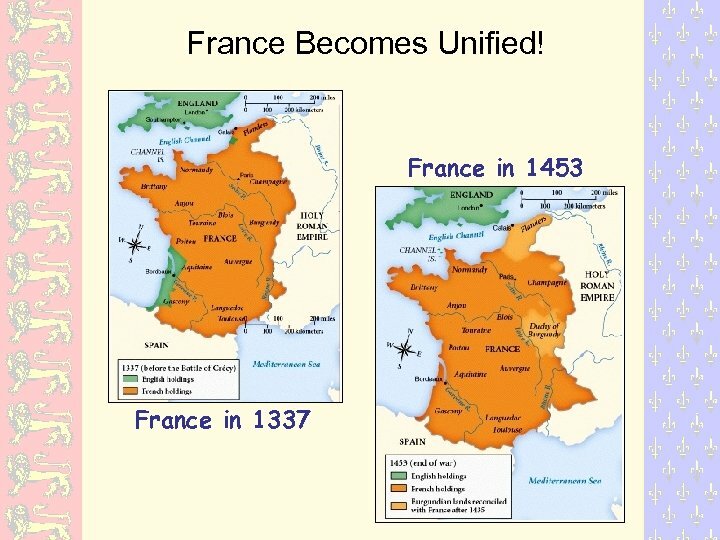 Even though in 1428 the military and political power seemed firmly in British hands, the French reversed the situation. 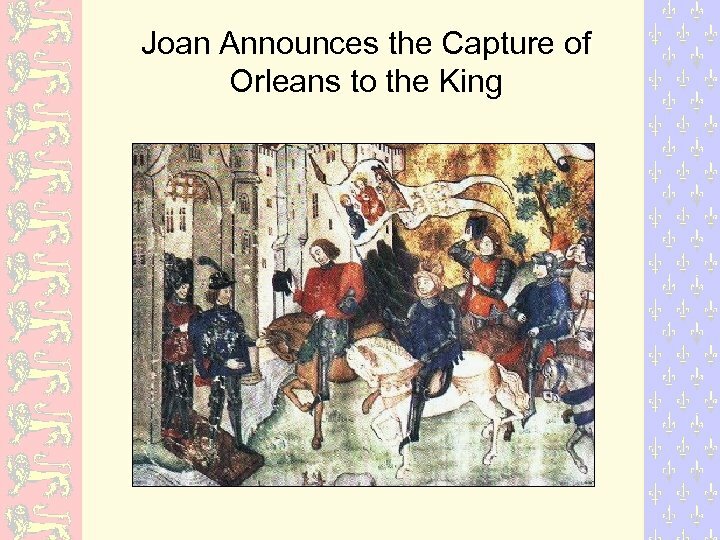 In 1429, with the aid of the mysterious Joan of Arc, the French king, Charles VII, was able to raise the English siege of Orleans. This began the reconquest of the north of France. 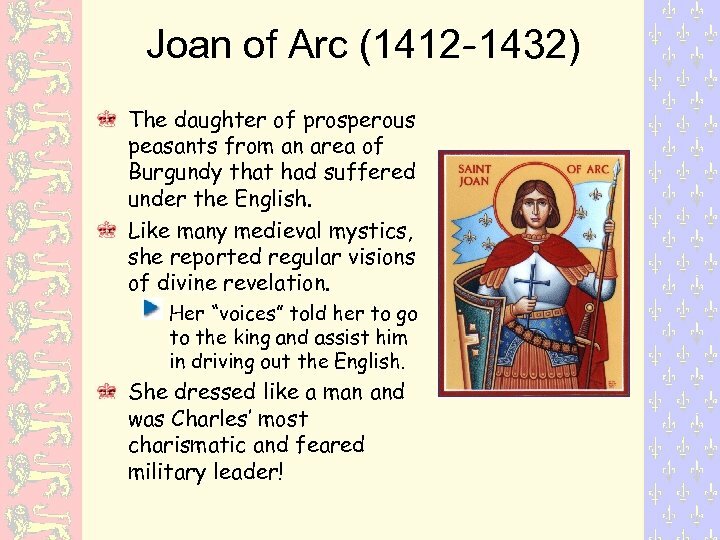 Joan of Arc (1412 -1432) The daughter of prosperous peasants from an area of Burgundy that had suffered under the English. Like many medieval mystics, she reported regular visions of divine revelation. Her “voices” told her to go to the king and assist him in driving out the English. She dressed like a man and was Charles’ most charismatic and feared military leader! 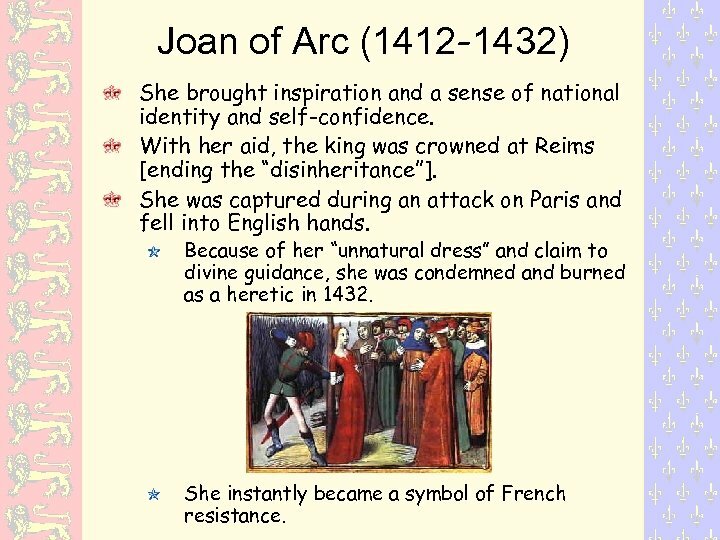 Joan of Arc (1412 -1432) She brought inspiration and a sense of national identity and self-confidence. With her aid, the king was crowned at Reims [ending the “disinheritance”]. She was captured during an attack on Paris and fell into English hands. Because of her “unnatural dress” and claim to divine guidance, she was condemned and burned as a heretic in 1432. She instantly became a symbol of French resistance. 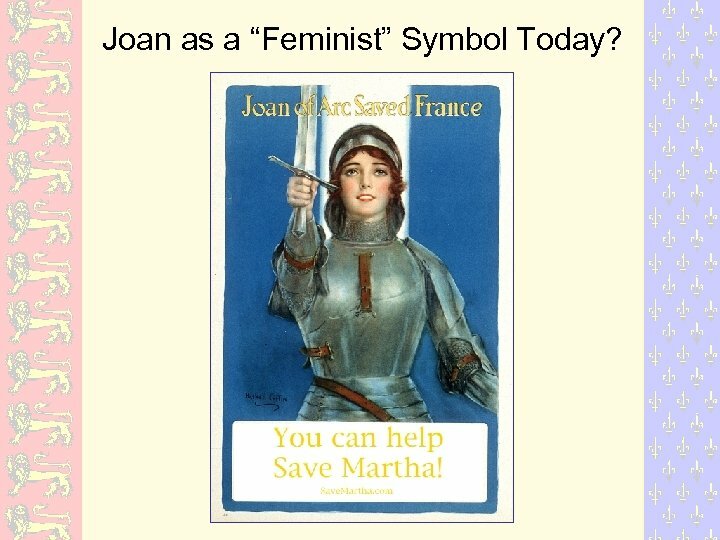 Joan as a “Feminist” Symbol Today? 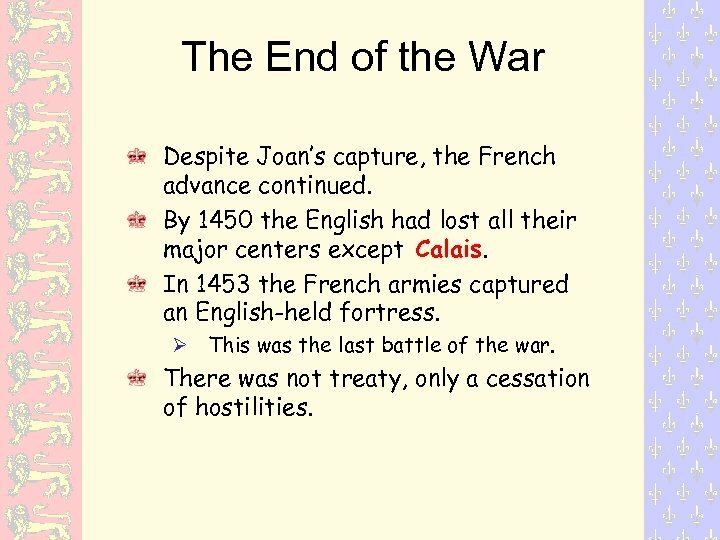 The End of the War Despite Joan’s capture, the French advance continued. 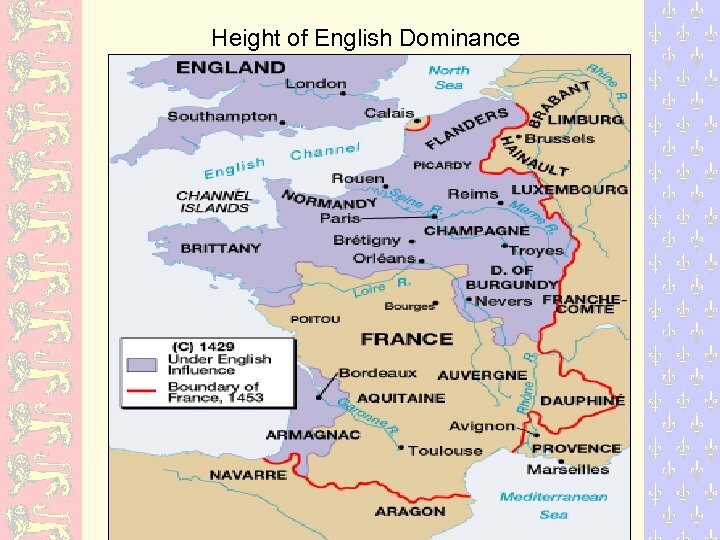 By 1450 the English had lost all their major centers except Calais. 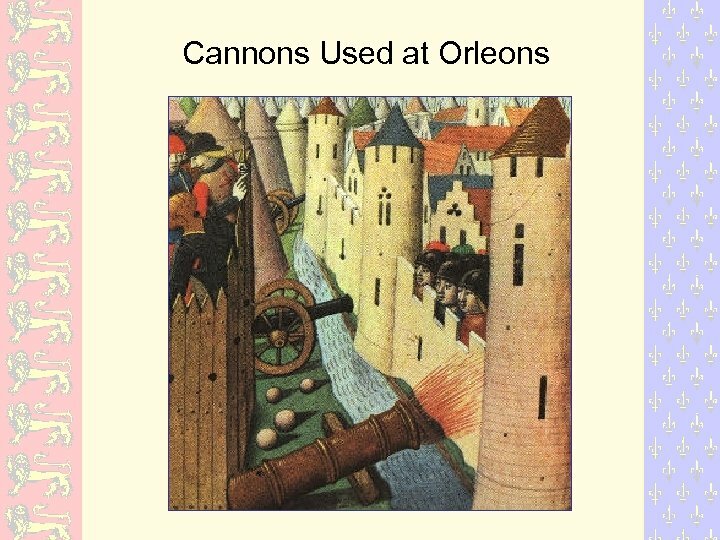 In 1453 the French armies captured an English-held fortress. This was the last battle of the war. There was not treaty, only a cessation of hostilities.